Nucleus-to-Cytoplasm microRNA Transport: A Two-Way Route? Microribonucleic acids, best known as microRNAs or miRNAs, are small, non-coding RNAs with important regulatory roles in eukaryotic cells. 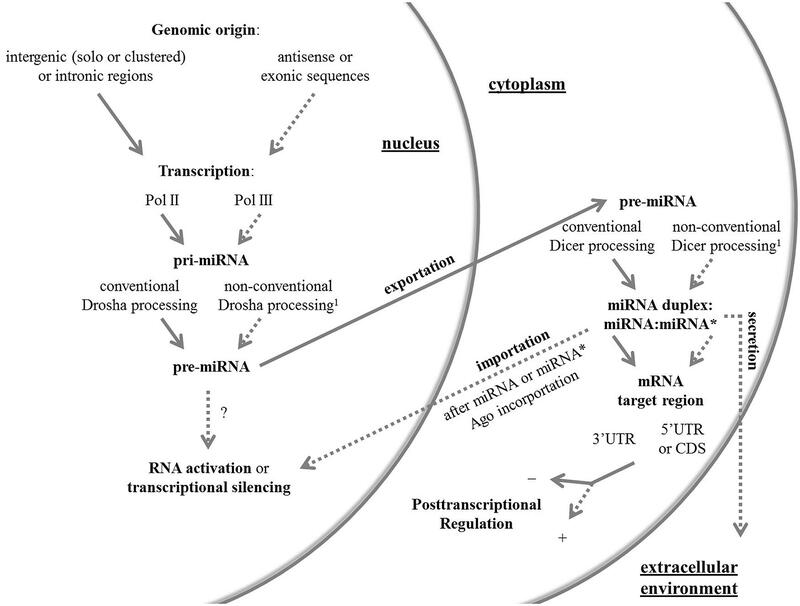 Here, I present a broad review on highly relevant but generally non-depicted features of miRNAs, among which stand out the non-conventional miRNA seed sites, the unusual messenger RNA (mRNA) target regions, the non-canonical miRNA-guided mechanisms of gene expression regulation, and the recently identified new class of miRNA ligands. Furthermore, I address the miRNA uncommon genomic location, transcription, and subcellular localization. Altogether, these unusual features and roles place the miRNA system as a very diverse, complex, and intriguing biological mechanism. MicroRNAs (miRNAs), a class of non-coding RNAs (ncRNAs) of approximately 23 nucleotides (nt), are well known for their role in RNA interference (RNAi), where they mediate posttranscriptional gene expression regulation (Bartel, 2009). miRNA genes generally reside in intergenic regions carrying their own promoters or in intronic regions of transcription units, therefore sharing the host gene promoter and being commonly transcribed by RNA polymerase (Pol) II (Bartel, 2004; Cai et al., 2004; Lee et al., 2004; Kim and Nam, 2006). The approximately 1000 nt primary transcript (pri-miRNA), a stem-loop structure with long single-stranded ends, is typically processed by a nuclear RNase III enzyme named Drosha, giving rise to an approximately 60 nt hairpin intermediate known as the miRNA precursor (pre-miRNA). This pre-miRNA bears an approximately 2 nt overhang at the 3′-end of the stem-loop structure, which is important for its further processing in the cytoplasm by a second RNase III enzyme, named Dicer. This second cleavage removes the loop of the pre-miRNA, leaving another 2 nt 3′overhang and, thus, a miRNA duplex (Bartel, 2004; Cullen, 2004). In general, only one strand of the miRNA duplex is loaded into the RNA-induced silencing complex (RISC), where it will guide, in a sequence-specific manner, mRNA degradation or translation inhibition (Cullen, 2004; Bartel, 2009). This interaction is mainly reported to take place between the 5′-end of the miRNA and the 3′untranslated region (UTR) of the mRNA. The process described above is generally seen as the miRNA canonical aspects and their main mode of action. However, current literature has brought to light non-conventional miRNA features, which are the center of this review. Hereafter, I review the current knowledge in the miRNA field with focus on the non-canonical facets of these molecules in animals, which are summarized in Figure 1. For a complete review on non-conventional Drosha and Dicer pathways, readers can address two published articles (Yang and Lai, 2011; Ha and Kim, 2014). FIGURE 1. An overview of the canonical and non-canonical aspects of miRNAs. Conventional and non-conventional features of the miRNA system in animals are outlined by full and dashed arrows, respectively. The non-conventional route can be represented by one or more unusual aspects. 1 Non-conventional Drosha and Dicer pathways have been reviewed elsewhere (Yang and Lai, 2011; Ha and Kim, 2014). Ago, Argonaute protein; CDS, coding sequence; Pol, RNA polymerase; pre-miRNA, precursor miRNA; pri-miRNA, primary miRNA; UTR, untranslated region. Although there is no consensus about the most frequent miRNA genomic location in animals due, among other factors, to varying miRNA genomic distribution in different species, there is no doubt that they mainly map to intergenic regions as solo or clustered genes or to intronic regions of defined protein-coding or non-coding transcription units (Bartel, 2004; Kim and Nam, 2006). The most striking deviation was shown in mouse testes, where approximately 30% of the miRNA genes mapped to exonic sequences (Ro et al., 2007). While it has been assumed that intronic miRNAs rely on host gene transcription in order to be expressed (Bartel, 2004), compelling evidence has suggested that a set of intronic miRNAs can be expressed, both in humans and Caenorhabditis elegans, independently of their host gene (Isik et al., 2010; Monteys et al., 2010). In a Drosophila melanogaster short RNA data meta-analyses, Berezikov et al. (2011) identified 12 miRNA loci also giving rise to miRNAs from antisense strand transcription and processing. Besides this potential source of novel miRNAs in Drosophila, Berezikov et al. (2011) located miRNA loci in coding sequences and UTRs. Antisense strand origin was consistently found in humans, although miRNAs derived from the antisense transcription of the miRNA loci showed to be lowly expressed (Burroughs et al., 2011). Canonical transcription of miRNAs involves Pol II, the same enzyme generally producing mRNAs (Cai et al., 2004; Lee et al., 2004). However, a miRNA cluster in human chromosome 19 (C19MC) downstream from an Alu repeat was shown to be associated only with Pol III, suggesting that this same enzyme, responsible for Alu activity, is also involved in C19MC transcription (Borchert et al., 2006). Moreover, on a bioinformatic approach, the authors proposed that miRNAs flanked upstream by tRNA-, besides Alu- based promoters, might be transcribed by Pol III. However, the first findings were challenged by Bortolin-Cavaillé et al. (2009), who proposed that C19MC miRNAs are actually derived from Pol II placenta-specific non-protein-coding transcripts. Still, further studies have shown that miRNAs of murine γ-herpesvirus 68 (Bogerd et al., 2010) and herpesvirus 4 (Diebel et al., 2010), and miRNA-like small RNAs of Neurospora crassa (Yang et al., 2013) are indeed transcribed by Pol III. Therefore, it remains to be demonstrated whether functional miRNAs can be produced through Pol III activity in animals. It has long been proposed, since the initial studies of miRNAs in C. elegans (Lim et al., 2003), D. melanogaster (Aravin et al., 2003), and mouse (Lagos-Quintana et al., 2002), that during miRNA biogenesis and maturation only one of the arms of the pre-miRNA fold-back is generally found accumulating at steady levels. The less common mature miRNA sequence derived from the precursor has been named miRNA∗ (miRNA star) or “passenger strand,” while the most abundant one has been named miRNA or “guide strand,” as it is thought to be preferentially incorporated into Argonaute (Ago) protein complexes and, therefore, to guide posttranscriptional regulation (Lau et al., 2001; Yang et al., 2011). However, several studies have suggested that miRNA∗ strands are more abundant than initially thought and that these might be more than mere carriers of the guide strand. Comparisons between human, chimpanzee, mouse, rat, dog, and chicken genomes revealed that several human miRNA∗ strands are highly conserved, especially at the seed sequence vicinity, which, in turn, exhibits significant 3′UTR complementarity across vertebrate evolution (Yang et al., 2011). miRNA∗ seed sequences and center regions have also been shown to be conserved across Drosophilid evolution (Okamura et al., 2008) and a group of typical vertebrates (human, zebrafish, chicken, and frog; Guo and Lu, 2010). By analyzing 10 different libraries from human and mouse deep-sequencing data, Kuchenbauer et al. (2011) found among all detected miRNAs a percentage of miRNA∗ ranging from 0.3 to 12.3%, suggesting a tissue and species-specific miRNA∗ expression. Moreover, classification into miRNA/miRNA∗ ratio groups pointed out that approximately 13% of all ratios favor the miRNA∗, while approximately 13, 24, and 50% favor the miRNA at low, intermediate, and high ratios, respectively. The class of miRNA duplexes giving rise to balanced strand expression was termed “β-duplexes,” while the class of miRNA duplexes giving rise to a dominant strand was called “α-duplexes” (Kuchenbauer et al., 2011). Finally, these broader and evolutionary analyses are accompanied by reporter assays focusing on validating the miRNA∗ functionality (Okamura et al., 2008; Ogata et al., 2010; Kuchenbauer et al., 2011; Yang et al., 2011; Byrd et al., 2012; Niederer et al., 2012; Chang et al., 2013; Goedeke et al., 2013; Martin et al., 2014). Altogether, these evidences suggest that all miRNA loci are potential dual-function genes, as two distinct miRNAs may originate from the same hairpin and, therefore, target different sets of genes (Okamura et al., 2008; Ogata et al., 2010; Ohanian et al., 2013). It is a general assumption that pre-miRNAs are transported by Exportin-5 in a one-way direction from nucleus to cytoplasm (Yi et al., 2003; Lund et al., 2004). However, many lines of evidence indicate that these molecules can also be guided back to the nucleus. A hexanucleotide terminal motif of miR-29b is responsible for this cytoplasm to nucleus transport (Hwang et al., 2007). CRM1 (Exportin-1), known to transport different classes of RNAs, enables the miRNA nuclear import (Castanotto et al., 2009). miRNAs and piwi-interacting RNAs (piRNAs) were found in the nuclei of spermatocytes and Sertoli cells (Marcon et al., 2008). These miRNAs may enter the nucleus to undergo modifications, associate with nuclear proteins or with target transcripts, participate in chromatin remodeling, or regulate ncRNAs. An example of miRNAs directly regulating transcriptional silencing includes the knockdown of POLR3D mRNA expression due to increased levels of mature miR-320 (Kim et al., 2008). Other examples of miRNAs found in the nucleus are miR-709, miR-690, miR-30e (Tang et al., 2012), and miR-122 (Földes-Papp et al., 2009). miRNAs can also be found in the nucleolus as precursor forms, like miR-494 and miR-664, and as mature miRNAs, like miR-21, miR-1, miR-351, miR-206 (Politz et al., 2006, 2009), and miR-320 (Marcon et al., 2008). Another intriguing subcellular localization of miRNAs is mitochondria, where they may modulate apoptosis processes in a coordinated way (Kren et al., 2009). Ago family proteins have also been consistently detected inside the nucleus (Ohrt et al., 2008; Rüdel et al., 2008; Tan et al., 2009; Ahlenstiel et al., 2012). It has been shown that Importin 8, besides being required for efficient binding of Ago2 to target mRNAs, directs Ago proteins to the nucleus of human cells (Weinmann et al., 2009). Taken together, these data add more evidence for the important function of regulatory RNAs inside the nuclear compartment. After translation initiation, interactions between miRNAs and mRNAs resulting in translational repression may occur beyond the well-defined 3′UTR target, possibly taking place at the 5′UTR and coding sequence of the mRNA (Lytle et al., 2007). Although there is still some debate about the mechanisms of repression induced by miRNAs binding to different regions of their targets (Lytle et al., 2007; Forman et al., 2008), several computational screenings have pointed to putative miRNA sites in coding regions and 5′UTRs (Stark et al., 2007; Forman et al., 2008; Lee et al., 2009; Forman and Coller, 2010; Schnall-Levin et al., 2010). Several screenings bring experimentally validated results from reporter assays mainly (Forman et al., 2008; Schnall-Levin et al., 2010), confirming the possible physical interaction of miRNAs with 5′UTRs and/or coding regions. Several other studies focusing on such reporter assays have also confirmed this non-conventional targeting (Tay et al., 2008; Qin et al., 2010; Schnall-Levin et al., 2011). It remains a challenge to identify the broadness of miRNA:mRNA interactions that take place elsewhere in the mRNA. Interestingly, Lee et al. (2009) observed among the 5′UTR motifs a preferential interaction of these sites with the 3′-end of miRNAs, suggesting that different ends of a miRNA may bind to both UTRs of an mRNA. Another type of interaction has been proposed to take place mainly between nucleotides 4–14 or 5–15 of a miRNA and its targeting sites, with these being named as “miRNA centered sites” (Shin et al., 2010). Together, these data indicate mRNA non-conventional seed sites, i.e., sites recognized by regions other than the miRNA 5′seed sequence. The discovery of miRNA-mediated gene expression regulation at the posttranscriptional level has revolutionized molecular biology, bringing new avenues to the treatment of several diseases, such as cancer and viral infections. However, emerging new mechanisms of gene expression regulation through miRNA activity should be considered by researchers when it comes to data interpretation and application. miRNAs have been recently proposed to recognize and guide transcription factors (TFs) to their correct gene promoters (Korla et al., 2013). Based on earlier results that many pre-miRNAs carry binding sites for TFs (Piriyapongsa et al., 2011) and that miRNAs target TFs (Dannemann et al., 2012), Korla et al. (2013) hypothesized that miRNAs would act as a decoy for TFs, driving them to their correct gene promoters. In a computational approach, miRNA seed sequences have also been shown to match gene promoters in a frequency comparable to miRNA/3′UTR matches and some miRNA/promoter pairs exhibited unusual sequence complementarity (Younger et al., 2009). Together with their previously discussed nuclear accumulation, these findings suggest that miRNAs may have an important function in this cellular compartment. Other studies have deeply investigated and reported miRNAs as negative gene transcription regulators (Kim et al., 2008; Younger and Corey, 2011). Another line of evidence has proposed that dsRNAs also regulate gene expression through a mechanism termed as RNA activation (RNAa), in opposition to RNAi. RNAa has been shown to take place in humans at the transcriptional level as a consequence of both sequence-specific promoter (Li et al., 2006; Place et al., 2008), and/or sequence-specific antisense transcript (Morris et al., 2008; Schwartz et al., 2008) targeting by dsRNAs. In the first case, dsRNAs promoted gene activation by targeting AT-rich promoter regions, while in the second case activation was achieved through chromatin structure changes. More recently, RNAa was also shown to occur in non-human primates, mouse, and rat (Huang et al., 2010, 2012). Positive regulation of gene expression is also an emerging feature of miRNAs at the posttranscriptional level. The first study to verify that miRNAs can act upregulating translation suggested a model by which human miR-369-3 directs, in a sequence-specific manner, the association of Ago and fragile X mental retardation-related protein 1 to the AU-rich element of the tumor necrosis factor-α (TNFα) mRNA under starvation conditions, leading to increased TNFα translation efficiency (Vasudevan et al., 2007). Similar results were found later and demonstrated that miR-10a targets the 5′UTR of ribosomal protein (RP) mRNAs resulting in RP enhanced translation under amino acid starvation. As a consequence, indirect global protein synthesis also occurred through the aforementioned miRNA–mRNA interaction, since it leads to increased availability of the translation machinery (Ørom et al., 2008). Together, this data may suggest that positive or negative posttranscriptional regulation by miRNAs might take place depending on the physiological state of the cell or organism. Another example of translation stimulation by miRNAs has been speculated by Jopling et al. (2005) and confirmed and detailed by Henke et al. (2008): the liver-specific miR-122, with two complementary sites on the 5′UTR of Hepatitis C Virus genome, induced viral RNA translation by contributing to the association of ribosomes in a sequence-specific manner. A miRNA–miRNA posttranscriptional regulation network has been postulated on the basis of the finding that primary mRNA-like ncRNAs in mice are significantly underexpressed in tissues where their putative targeting miRNA is expressed (Zhao et al., 2008). Indeed, such an example of miRNA–miRNA regulation has been recently demonstrated: miR-709 inhibits miR-15a/16-1 maturation by binding to its primary transcript in the nucleus (Tang et al., 2012). Similarly, in C. elegans, let-7 mature miRNA carries a complementary sequence to its own primary transcript, whereby the interaction, in the presence of Ago protein ALG-1, induces primary transcript processing (Zisoulis et al., 2012). More recently, long non coding RNAs (lncRNAs) were shown to be potential targets of miRNAs, revealing also a possible miRNA-lncRNA regulation network (Jalali et al., 2013). These exciting results may open new possibilities to restoration strategies of pathologically relevant altered miRNA expression patterns. It has for long been a dogma that miRNAs loaded in RISCs bind to mRNAs through Watson and Crick base pairing. Interaction with other molecules, such as proteins, remained unknown until recently, when miRNAs were found to bind to and inhibit the activity of a class of RNA-binding proteins (RBP), named heterogeneous ribonucleoproteins (hnRNPs), in a RISC-independent manner, but yet in a sequence-specific interaction (Eiring et al., 2010). Similar findings by Balkhi et al. (2013) have proposed miR-29 as a decoy for another RBP, named human antigen R (HuR). In a later study, two miRNAs with extracellular expression – miR-21 and miR-29a – were shown to reach a different cell and bind to murine Toll-like receptor (TLR) 7 and human TLR8, both located inside endosomes (Fabbri et al., 2012). The authors also verified that the miRNA–TLR interaction is immunologically relevant, as typical cytokines upregulated upon TLR activation were augmented in murine and human cells expressing TLR7 and TLR8, respectively, after treatment with miR-21 and miR-29a, miRNAs typically secreted by tumor cells. Similar results were found for another miRNA in the context of the nervous system. Using a murine experimental model, the extracellular miRNA let-7b was shown to directly activate the TLR7, inducing neurodegeneration (Lehmann et al., 2012). These results are extremely relevant as the authors also found that let-7b is overexpressed in Alzheimer’s disease subjects in relation to healthy controls. Another role for let-7b in the nervous system has been recently described, proposing that this miRNA acts as a pain mediator through TLR7 and ion channel activation in nociceptor neurons (Park et al., 2014). Mir-21, in turn, has been recently reported to mediate cell death of murine myoblasts through TLR7 (He et al., 2014). In summary, the existence of another class of miRNA-binding molecules is suggestive of an even wider role of these ncRNAs in development and disease in animals. The canonical field of miRNAs has not yet been fully challenged and the next years of miRNA research will continue to teach us how complex this system is. With the growing usage of next-generation sequencing methods in transcriptomics, the identification of new genomic sources of miRNAs must rely on careful inspection of deep sequencing data, as RNA degradation fragments may be easily read as small ncRNAs. Another issue in miRNA research is that algorithm-based websites for the identification of miRNA binding sites, which are among the most diverse and used bioinformatic tools, frequently overlook 5′UTRs and coding sequences as potential targets of miRNAs and rarely consider their non-seed sequences as being likely to induce posttranscriptional regulation. This limitation clearly brings a bias to miRNA studies and might be responsible for several data misinterpretations. Moreover, the fast-growing field of extracellular miRNAs may contribute not only to the elucidation of the mechanisms involved in cell–cell communication, but also to our knowledge of the repertoire of miRNA-binding molecules. Finally, if on one hand the different emerging modes of gene expression regulation involving miRNAs suggest caution to their clinical application, they might on the other hand open new avenues for therapy strategies. The author would like to thank Dr. Maria Luiza Petzl-Erler for indirectly inspiring the scope of this review, Sheyla Mayumi Kuniwake with whom this review was initially idealized, Dr. Roseli Wassem for the critical reading of this manuscript, and the Coordenação de Aperfeiçoamento de Pessoal de Ensino Superior (CAPES) for the Ph.D scholarship. Korla, K., Arrigo, P., and Mitra, C. K. (2013). Promoters, toll like receptors and microRNAs: a strange association. Indian J. Biochem. Biophys. 50, 169–176. Accepted: 08 September 2014; Published online: 23 September 2014. Copyright © 2014 Cipolla. This is an open-access article distributed under the terms of the Creative Commons Attribution License (CC BY). The use, distribution or reproduction in other forums is permitted, provided the original author(s) or licensor are credited and that the original publication in this journal is cited, in accordance with accepted academic practice. No use, distribution or reproduction is permitted which does not comply with these terms.